Hillcrest Park was placed on the National Register of Historic Places for both its historical importance to the development of the City of Fullerton and its distinctive landscape characteristics. Constructed on 35.6 acres, Hillcrest Park is the City's largest, most beautiful, and historically significant park. In January 1920, the City of Fullerton purchased 33.649 acres from Fred M. West for $67,298 for use as a park. Two acres of the property had been acquired earlier for a reservoir on September 8, 1913, and the remaining property was considered ideal for park purposes. At the time of the purchase, the property was vacant aside from a few wildflowers and barley fields. Two local businesses were using the parkland: Dean Hardware was storing a cache of dynamite in the hillside off Brea Boulevard, and Arthur W. Purdy was leasing land at the base of the hill off Lemon Avenue for his diary business. Fullerton had only 4,415 residents in 1920, but town boosters, who were primarily transplants from other areas of the nation, recognized that they were building a town and were eager to establish a park system. Then known as Reservoir Hill, the parkland property was selected because it would be a recognizable landmark from the northern approaches to the city. It was also envisioned as Fullerton's "great" park. 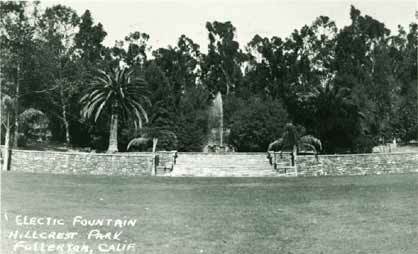 The Fullerton Board of Trade was entrusted with naming the site, and after soliciting suggestions from the general public, the parkland was christened "Hillcrest Park" on May 19, 1920. When the land for Hillcrest Park was purchased, Fullerton's park system was in its early development stage. The Park Commission, established in 1914, oversaw one city-owned park, Amerige (formerly Commonwealth) Park, and the library and grammar school grounds. Park planning progressed on a piecemeal basis until the Park Commission decided to hire a park superintendent. The Fullerton City Council instructed the City Clerk to advertise for the position on July 24, 1918, and Johann George Seupelt was hired as Fullerton's first park superintendent on October 18, 1918. Seupelt quickly developed plans for Amerige Park, and when the land for Hillcrest Park was purchased, began preliminary plans for what was to be Fullerton's largest park. By 1922, Seupelt had completed formalized plans for Hillcrest Park. Bavarian-born Johann George Seupelt arrived in Baltimore in 1904. He served as a horticulture instructor at Washington State Agricultural College in Pullman from 1906 to 1908, then as Spokane's city forester from 1908 to 1915. During this time, he wrote articles on gardening and delivered speeches on tree planting and management. In 1908, Seupelt became the first student from Washington State Agricultural College to receive an M.S. in horticulture and landscape architecture. He became a United States citizen in 1909. In 1917, Seupelt moved to Los Angeles to assist the great California landscape architect Paul G. Thiene, who was then establishing a private practice. Born and educated in Germany, Thiene specialized in Italian and Spanish gardens of great size and intricate detail, most notably the grounds of the Doheny or Greystone Mansion in Beverly Hills, now a public park. In October 1918, Seupelt accepted the position as Fullerton's first park superintendent. After assuming his position, Seupelt quickly implemented changes to Fullerton's park system. In November 1918, he completed plans for Amerige Park, which were immediately approved, and the park grounds were quickly developed. That same year, Seupelt began systematic tree planting in the city. Over 2,500 trees were planted at a cost of $4,883 throughout the city's thoroughfares. He completed plans for the grounds of Wilshire Avenue School (1914), Fullerton's second elementary school, which were implemented over the next two years. For his landscaping projects, Seupelt initially trucked in free plants and trees from Santa Ana and other nearby cities, but by 1920, he had established a nursery that provided many of the plants needed for public landscaping. He also continued to purchase plants and trees from local growers in Fullerton, Anaheim, and Placentia. After his services with the city were discontinued in 1925, Seupelt opened a landscaping business in downtown Fullerton (109 N. Spadra). While in Fullerton, Seupelt also completed landscaping plans for the Fullerton Hospital, the La Habra Women's Club, Whittier College, the Montebello City Park, and grammar schools in Anaheim, Brea, and Placentia. In addition, he designed four electric city signs for the Chamber of Commerce, which were placed at the principal gateways to Fullerton. In 1926, Seupelt returned to Spokane where he worked privately and as the consultant landscape designer for the cities of Chewelah and Colfax, then as principal landscape designer for the architectural firm of Whitehouse and Price. Seupelt completed projects for Ernest V. Price and Harold C. Whitehouse, who designed hundreds of buildings throughout the northwest, until his death in 1961. His most significant project during this period was landscaping the Spokane Cathedral of St. John the Evangelist (1925-1954), an elaborate Gothic Revival church designed by Harold C. Whitehouse (1884-1974), and listed on the National Register of Historic Places. Eminently qualified for horticulture and landscaping work, Seupelt was in the unfortunate position of being employed in government positions during World War I when anti-German sentiment was high. While living in Spokane, Seupelt was attacked by the editor of the Hunters Leader, a weekly newspaper published in Hunter, Washington, for being "un-American," and after moving to Fullerton in 1918, he experienced similar anti-German discrimination. Seupelt was reappointed as Fullerton's Park Superintendent on May 5, 1920, but in September 1921, a petition circulated calling for his dismissal. The Fullerton City Council dismissed the petition "owing to the fact that no charge or reason for such action was set forth," but when he was not reappointed in 1925, his German ancestry appeared to play a primary part. Much of Hillcrest Park's distinctive look is due to work completed during the Great Depression. Because many of the Park's visible elements, such as the fountain and road rockwork, were built by Work Projects Administration workers, much of the general information about the Park incorrectly assumes that the WPA was responsible for all of the Depression-era parkland improvements. In reality, Fullerton officials took full advantage of funding offered through a number of Depression-era programs: the Reconstruction Finance Corporation, Civil Works Administration, State Emergency Relief Administration, and the Work Projects Administration. Thousands of man hours and hundreds of thousands of dollars of relief funds were funneled into Hillcrest Park from 1931 to 1943, and it was the utilization of these monies that gives the Park its definitive character, shape, appearance, and feel. By the end of the Depression, relief workers had transformed Hillcrest Park into a truly unique environment, one with imaginative landscaping and a comprehensive and representative collection of leisure and recreational structures for the public. The transformation of the Park could only have been accomplished so extensively through the WPA and its predecessor agencies. At the time, money was scarce, but the ready availability of workers coupled with government public works projects served as an economic stimulant for the further development of Fullerton's finest park. The mass utilization of labor produced a public landscape that could not be recreated today, and Hillcrest Park stands as a legacy of New Deal and other work programs of the 1930s. One of Hillcrest Park's most distinctive features is the flagstone that runs throughout the parkland. Aside from a row of flagstone pilasters constructed in 1934 in Amerige Park (1914), Fullerton's first city-owned park, this stonework is unique to Hillcrest Park. Flagstones of varying sizes and shapes are used in Hillcrest Park to pave and decorate walkways, stairs, benches, lawn and plant borders, walls, curbs, columns, pilasters, stoves, tables, barbecue pits, a fountain, and a bridge over a former lily pond. The stonework, which was used as an exterior finish over concrete, also delineates activity areas, creating separate spaces within the Park, and serves as a unifying element, providing design continuity throughout the parkland. The hand-crafted use of natural materials, common for WPA park construction, also lends a rustic and woodland feeling to the Park. Rock work began with laborers hired by the Reconstruction Finance Corporation, then continued with workers funded by the Civil Works Administration, the State Emergency Relief Administration, and the Work Projects Administration. Rock for these projects was quarried by city employees in Pomona and the Imperial Valley, then trucked to Fullerton. Fullerton officials relied on skilled rockmasons (assisted by helpers) to construct the stonework. Because New Deal programs were designed to put men to work, all the labor-intensive stonework was completed by hand from 1933 to 1941. Hillcrest Park has two war monuments and three plaques that honor Fullerton servicemen killed during major wars fought in the 19th and 20th centuries. Since 1983, memorial services have been held annually on Veterans Day at the two monuments. The Park also has three distinctive buildings. The Hillcrest Recreation Center is the former American Legion Patriotic Hall, constructed in 1932 on land donated by the City of Fullerton in 1927. The other small recreation building off Lemon Avenue is the former Fullerton Boys and Girls Library (1927) that was moved to the Park in 1940. Located centrally in the Park is the Izaak Walton League Cabin. This rustic building, Fullerton's only cabin, is a reconstruction of a 1931 cabin that was destroyed by fire in December 1990.